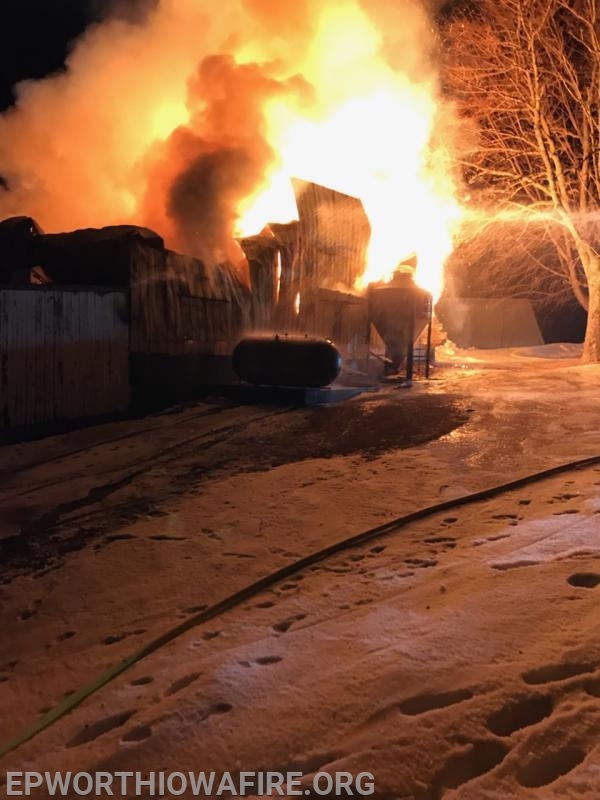 On Monday, March 11, 2019 at 11:34 p.m. the Epworth Fire Department was notified by the Dubuque County 911 Center of a working structure fire located at 21728 East Pleasant Grove Road, Epworth. The 911 center received numerous calls from people in the area reporting the fire. Upon arrival, firefighters found a fully engulfed barn fire. The farm is owned and occupied by Steve McDermott. Mutual aid assistance was provided by the Centralia-Peosta and Farley Fire Departments for water support with tankers. 19 firefighters responded and remained on the scene for over three hours. The 40x60 barn is a total loss. The barn is valued at $80,000 and there was also a loss of $20,000 in contents. The Epworth Fire Department was also assisted at the scene by the Dubuque County Sheriff’s Office and Maquoketa Valley REC. No animals were in the barn and no injuries were reported. The cause of the fire is not known, but is not suspicious in nature.